I first discovered seafood tacos on a tip to San Diego. I was amazed that you could get fish tacos at a fast food restaurant chain called Rubio’s and that you could enjoy them on a beach, just steps away. 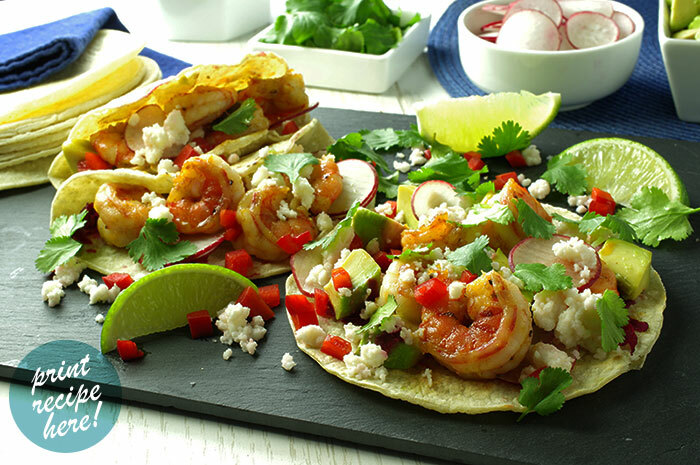 Part of the West Coast approach to cuisine is a casual entertaining style, and these shrimp tacos are ideal for feeding a crowd. 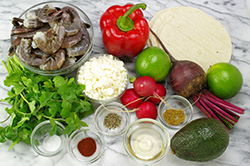 Simply set out the prepped ingredients in small bowls and let your family and friends build their own colorful plates. 1. In a small bowl, combine the grated beet with the vinegar. Stir to evenly coat the beet with the vinegar. 2. 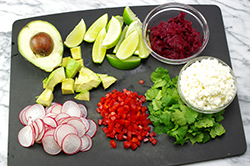 Arrange the beet, avocado, bell pepper, radish, cheese, cilantro, and lime wedges in small individual bowls. 3. 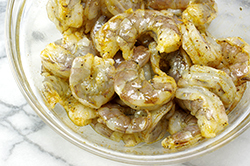 In a medium bowl, combine the shrimp with the salt, pepper, cumin, chili powder, and oil. 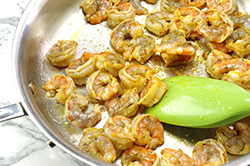 Toss the shrimp in the seasoning to evenly coat. 4. Heat a grill pan over high heat. When it’s hot, oil the pan. Add the shrimp and raise the heat to medium-high. 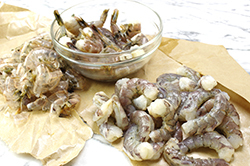 Cook the shrimp for 2 to 3 minute on each side, until opaque. Transfer them to a serving bowl. 5. 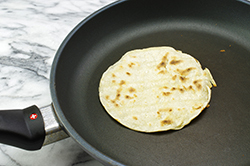 While the shrimp are cooking, heat the tortillas individually in a dry pan for 30 to 60 seconds each, or in a stack in the oven at 200°F (93°C) until they are warmed through, about 15 minutes. Stack the warmed tortillas and wrap them in a clean kitchen towel; serve in a basket. 6. Grab a plate and build your tacos! NOTE: I like to use La Tortilla Factory Artisan Tortillas because they are fairly easy to find and their texture is more like homemade tortillas than most store-bought varieties. Reprinted with permission from Eating in Color by Frances Largeman-Roth. Copyright 2014. Published by Stewart, Tabori & Chang, New York, NY. All rights reserved.